Let’s face it. The birthday cake is the highlight of every child’s birthday celebration. It’s the centrepiece that wows not only the kids but the adults too. An impressive birthday cake with a happy child does make a great photo opportunity! Lucky for us in Singapore, getting themed cakes is relatively easy. The popular cartoon licensed characters are readily available at the popular chains such as Swensen’s or Bengawan Solo at rather affordable prices. Someone will know of someone who takes private orders for awesome themed cakes but that comes with a hefty price tag and you probably have to self-collect on the day of the party. Or just call Lalamove or Ninja Van. 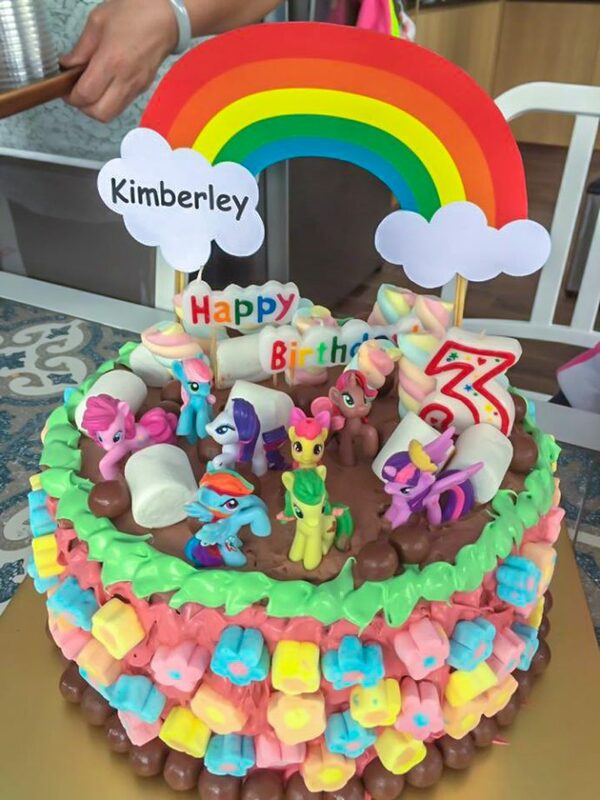 If you have been toying with the idea of baking your kid’s themed cake, here are some tips and tricks that can not only help you save some money but also impress both the little ones and adults at the party. This works well if you cannot bake or may have forgotten to order a cake. 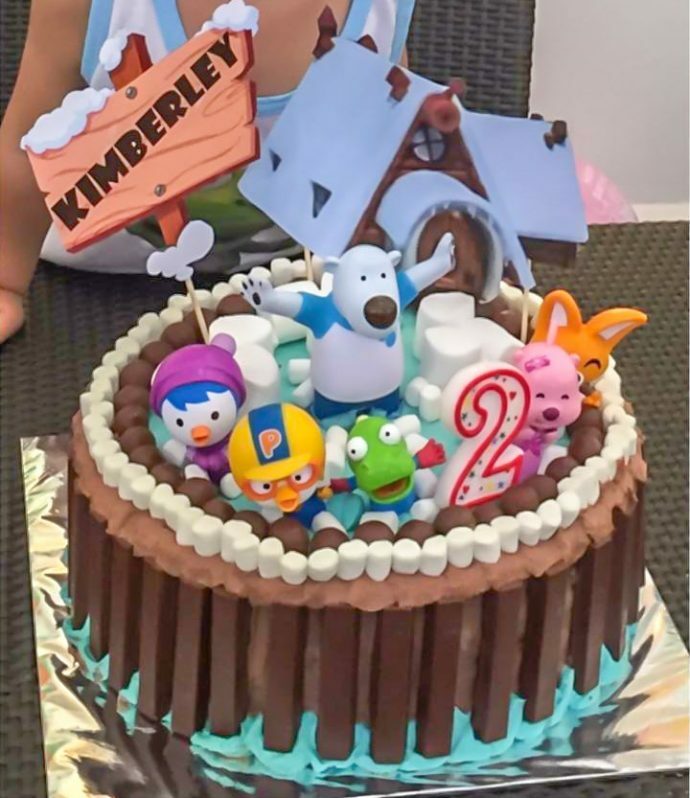 If your kid already has the little character figurines of their choice, give it a thorough wash and dry, buy any readily available cake of your choice or your kid’s favourite cake, and use the figurines as a cake topper to turn the plain cake into a theme cake. If that’s still too plain looking, you can even throw in some colourful marshmallows or chocolate balls, rainbow sprinkles, whatever fanciful and available at the baking section of any supermarket to dress that off the rack cake up! If your kid is into the not so popular characters where it’s hard to find figurines both at the toy stores here or even online, if they are below 4 years old, you can still try to “influence” them to opt for the more popular characters by showing them online photos of those character themed cakes, or simply let them watch more cartoons of your preferred characters! This requires a little more effort and works for the moms who are adamant to produce the cake themselves but has never baked a cake before. Major supermarket chains do have ready cake mixes, with idiot proof instructions such that all you need is a cake tin, handheld mixer, oven and the specified ingredients stated on the package, and you have a home-made cake! No idea how to make your own frosting, fear not, you can get ready frosting out of a tub which you can even add your own food colouring to have it in whatever colour you like. To make it fancier, simply bake 2 cakes and stack it up into a really tall and impressive cake. 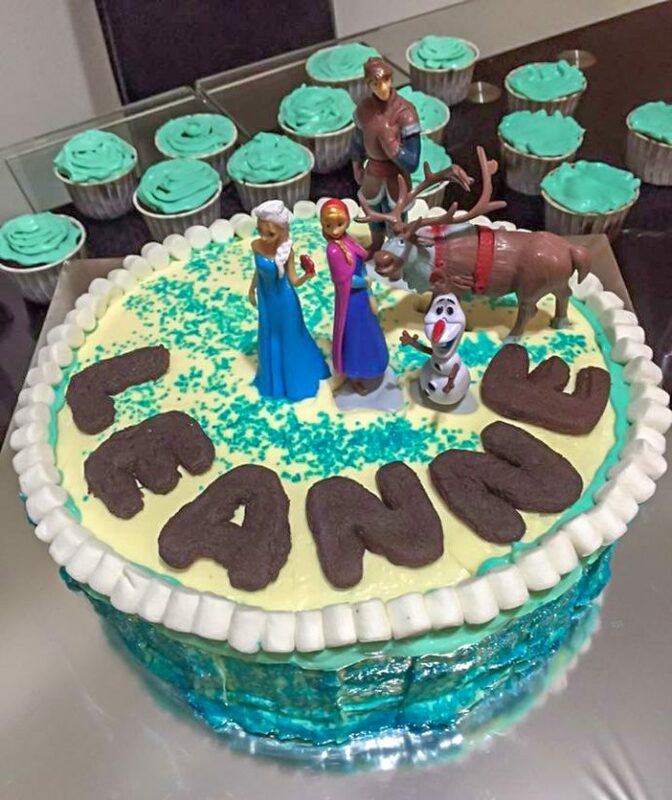 Once you have the cake and frosting ready, you can stick those cartoon character figurines on it and play around with different coloured frostings to dress up the cake. I personally like to throw different coloured marshmallows and Maltesers as add-on decorations. Need inspiration on cake designs, Google or Youtube for ideas! 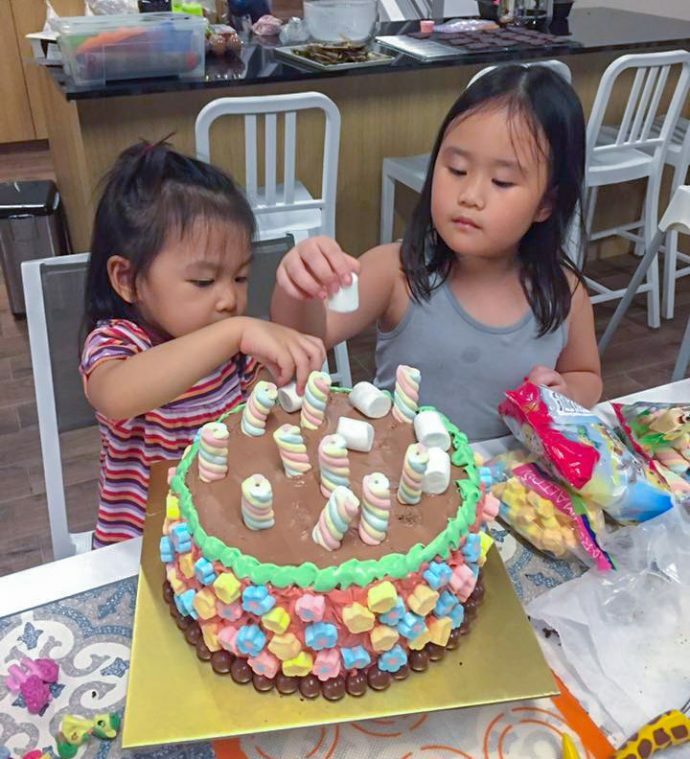 If you are a first timer, I do advise you to do a trial run before the actual birthday event to get an idea how your oven works, how the cake turns out and figure out how you want the cake to look. This dry run will get your kid ready and psyched up for their upcoming birthday! Instead of cake tins, the same trick applies to cupcakes! You either buy readily available cupcakes and dress it up yourself or you use the ready cake mix and pour it into colourful cupcake baking cups which Phoon Huat stores do have a huge variety in terms of sizes, colours and design. 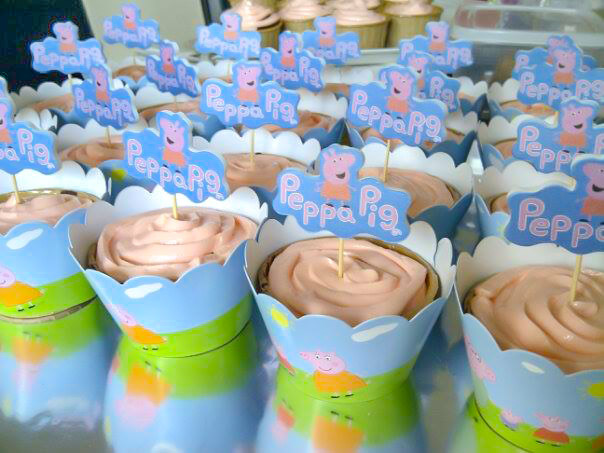 If you are planning to go the cupcake route, most partyware shops do have cupcake rings or wrappers and cupcake stands that brings the theme to life! For more ideas, you will be amazed how much inspiration and ideas you can find online, even if you are not artistically inclined! What ’s more, if you are attempting to do it yourself at home, you can even rope in your little one to help with the decorations or even just licking the frosting off the spoon. Making the birthday cake together at home will bring great memories for both you and bubba next time! And if you are wondering what kind of party games you should organise for your kids birthday party, check out Angel’s recommendations in her piece on Back-to-Basics Kids Party Games and Activities that don’t cost much.